I have two bountiful lemon trees in my backyard. I love these trees and what they provide. While I use lemons most every day – in drinks, in marinades, in salad dressings, as a flavor enhancer in all kinds of dishes – I still get overrun with crazy lemons! As weird as it may seem in other parts of the world, when you live in Southern California, it gets hard to pawn off fruit. People show up to work with bags and bags of lemons, oranges, etc and usually everyone just yawns. 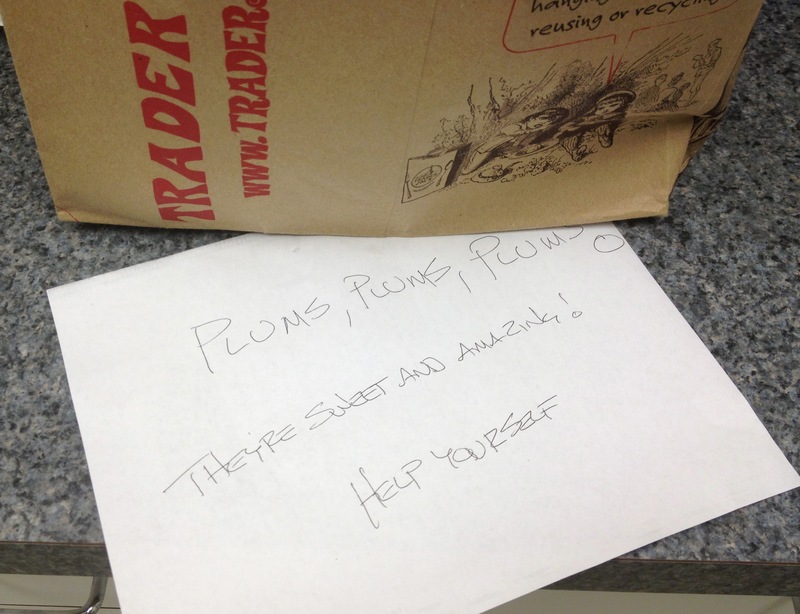 Monday at work, from someone’s tree… these were amazing plums. Given my lemon bounty, I started looking for ways to use the extra. I discovered my favorite a few years ago: Preserved Lemons. 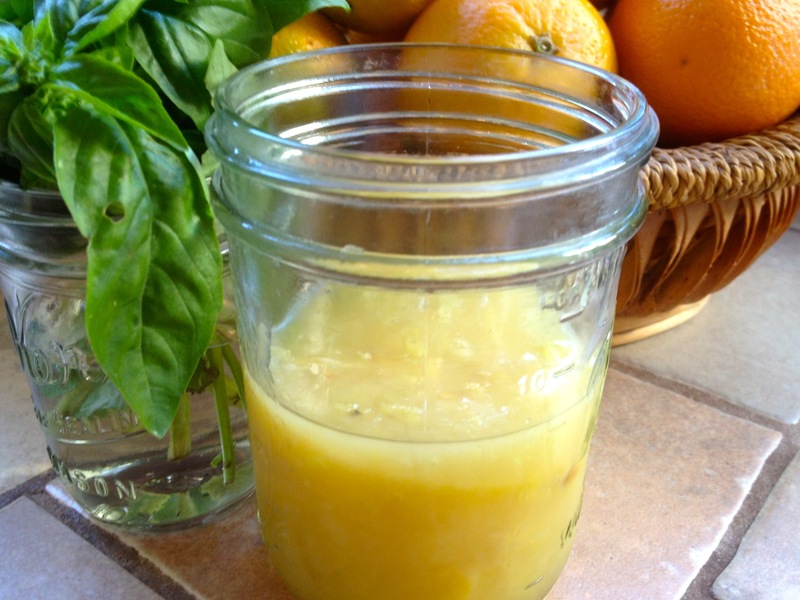 Preserving lemons is so easy, and the result so wonderful, there is always a big jar of preserved lemons in my fridge. Besides extending the life of the fruit, preserving lemons make the entire lemon edible. In fact, the rind becomes the best part to use, though everything in the jar, once preserved, is terrific for cooking. 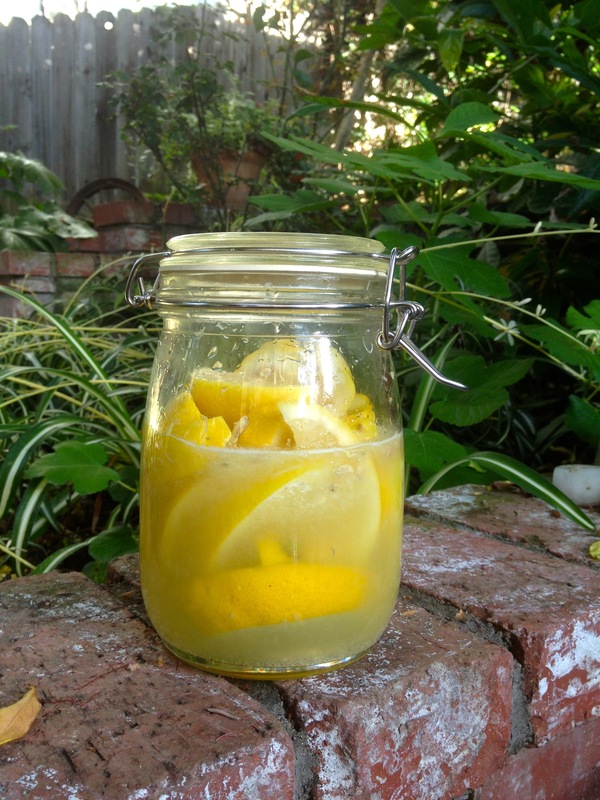 Preserved lemons keep nearly forever, so you don’t have to rush to use them, a wonderful perk. But use them you will, I assure you. I’ve tried many methods for preserving lemons. The easiest I’ve tried, which is also the best, is from Patricia Wells, a wonderful woman about whom I wrote last year. I was able to spend a week with her in France a couple of years ago, a week that remains a highlight for me. During the trip I cooked once on Julia Child’s original stove from her home in France. No, seriously, I did. – Scrub 2 or 3 of the lemons well. You will be eating the entire lemon so get them clean. Make sure they are rinsed and dry. Cut each into 8 wedges, lengthwise. – In a bowl, toss the lemon wedges, 1/3 cup coarse sea salt and the fresh lemon juice to coat the fruit. It’s not that attractive but, wow, are they amazing with which to cook. The lemon slices themselves are terrific. Preserving them takes the bitterness out of the rind. They become soft and salty and tasty, with a wonderful tart lemon flavor. Chop the lemon slices into small dice and toss with couscous, salads, steamed or roasted vegetables… basically anything savory that calls for a lemon kick. Throw the slices, chopped or whole, into meats you braise: lamb and chicken in particular are wonderful with these. As is broiled fish. If you want a lemon flavor in meatballs, add small dice to your meatballs. If you like Moroccan or Middle Eastern foods, preserved lemons go in almost everything, from meat or vegetarian tagines to salads and hummus. You can use these in risotto… well, the list goes on and on. The ‘goop’ that forms, as I like to call it, also can be used in many ways. I always use the goop in my homemade vinaigrette, recipe right here. The goop is great in most any marinade. Or you can simply use it as a marinade by itself, slathering it over a whole chicken to roast, or chicken thighs, any meats or fish to roast or grill. Yum. Some recipes call for herbs or spices in the jar but I feel that gets you stuck with certain flavors, flavors you can add later to your dishes. Why get stuck with a rosemary flavor in your preserved lemons when you might not want that in a particular dish? While a bay leaf or two certainly won’t hurt, I like the lemons and goop pure. I have a terrific Wheat Berry Salad recipe upcoming for the 4th of July that is perfect for preserved lemons. I will also be posting an amazing roast chicken with preserved lemons recipe I invented coming later this summer. 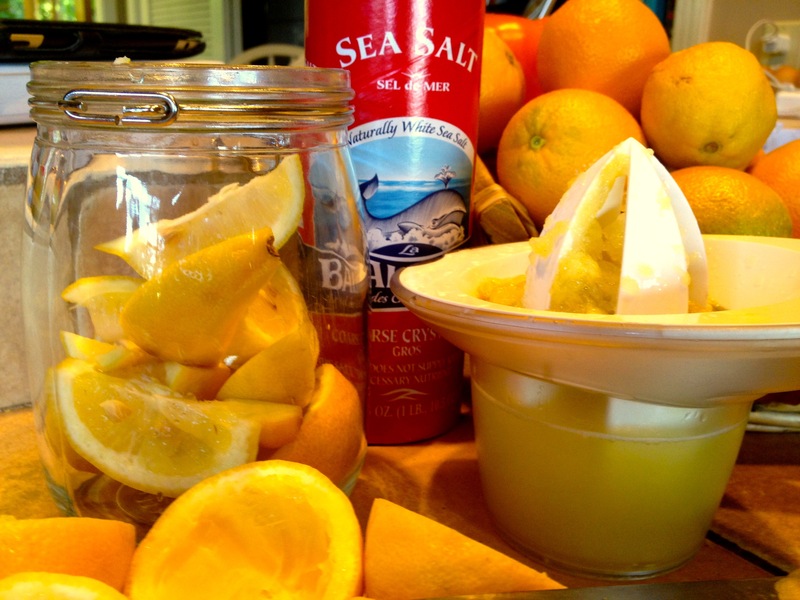 So preserve you some lemons now to be ready. But once they are ready, you don’t have to wait. You can use them most every day. It’s so good in so many things…. Tom- Once again you are making my mouth water. There is nothing better than a fresh lemon off of a southern California tree. We always enjoyed getting boxes of them from my grandparents. I guess they had to pawn them off all the way to Texas. I’m going to have to try this. Thanks for the inspiration. I have a mandarin tree and for the last few years have made a delicious mandarin marmalade. I’ve also made mandarin icecream and this year I’m also going to try a mandarin pickle. Calling myself the mandarin queen. Would love to know how you make those!